Printed (Mistral 2.1a) for Anet E3D conversion, excellent cooling, the best I could try from Thingiverse ! Hello, I have a different extruder assembly setup for my 3D printer. Can anyone please share any .stp file for Fusion 360 file so that I can design a suitable bracket for my extruder setup, please. I've added the Mistral V2.1a to the files section in step format for download. too big on ANET A8? What did I do wrong? Wrong file. You need to use "Mistral_V2.1a_Leo_N.stl"
Thanks my bad. Nice design. I've printed the Mistra 2.1a. I fits perfectly the original A8's cooling fan. Hello Leo, congratulations on the fantastic work. I have a question for you. Is it possible to use this duct while keeping the firmware stock? My problem is that when I'm near the bed, the temperature of the extruder drops about 15 degrees Celsius. And I don't think there is a way to adjust the PID with the stock firmware, or am I wrong? The only possibility I have is to start from layer 1 with the fan at 50%, and then go up to 75%. Do you think it's the right choice? Or is there an alternative solution? I would like to avoid changing the firmware. You do not need to upgrade the firmware. The fan duct will work with the original firmware. You need to set your slicer so that on the first 2 layers the fan stays off. Then have the fan gradually turn up the speed until it runs at 100% (for PLA) at 5 or more layers. My Mistral was first on the block. I had the Mistral set up with the wish that it not be remixed as I was afraid all my hours of testing would be worthless if people changed the form. One person was very upset that I chose the route I did, so he tried to copy it and gave it a name as well. Is Mistral 2.1 compatible with Anet A6? I can see black acrylic Anet A6 on some photos in Makes, so it seems to be compatible. But which version? Is it available to download in Thing Files or you send beta-version on demand? No, it only works on the A8. I only make things for the A8 as that is the printer I have. What is the distances from the center of the fan "input" (the square hole where the fan blows air into), and the optimal position of the nozzle ? I need a drawing to answer that. Very interesting. I just noticed you didn't remove the small wall in the slot. That is only needed for support while being printed. Yes I know, but I let it because it helps to block in Z position. Thanks for your comment and your help ! Great work! It made a big difference to the quality of prints, which came out much smoother. Printed one, then printed another in the improved quality. Great Nozzle. Great work! Thanks! Hey! Been using this duct for ages now, works really awesome. If possible lower the duct until it is even with the lowest part of your blue protector. Thanks for the reply! Should I align it to the red or the green arrow in the attached picture? Hi all, I've tried a couple of times to print this beautifull cooling duct in 1.75mm PLA but at beginning of print the two tubes at bottom line getting lose on the glass build plate. All my other prints do print awesome, only this one doesn't like to print. In Cura I can't find 'top and bottom layer heigt' as recommended by Leo_N. You need to print the Mistral with the ducts pointing up. Look at the pictures and please read the summary and notes. Printed in PETG with the Anet A8 to upgrade the semicircular fan duct. While with that one I was having good results but an unwanted drop in nozzle temperature, with this one I'm having much more reliable behaviour and almost no temperature changes. Pretty happy with the looks of it and with great results too. Printed the last version, without any support, no problem at all, just a little break when trying to remove the small tab, fixed with some glue. Is the PID auto tuning also feasible / usable with the stock main board and firmware? Yes, I've done it with repetier. I don't know with the stock FW. I'm using Marlin and would definitely recommend the procedure. So, i am planning to adapt this thing to my custom built 3d printer, but importing this stl file is impossible, is there a chance you can upload and or provide an skp file ? first I want to say I really like your design! It's probably the best fan duct there is and I have been using it for quite a while now without problems. Thank you for creating it. Nevertheless I have a quite special request: I have upgraded my printer with a Chimera double nozzle. Because of this the two nozzles of the fan duct have to be exactly 9mm shorter than in the original design. I was able to achieve this by simply scaling the nozzles down using Blender, however the result is not yet perfect. In the attached picture I drew two lines on the nozzles of the two fan ducts. The black line resembles the approximated current shape of the ducts. However to have more space for the cables of the heaters I would prefer a shape similar to the drawn blue line. I fully understand if you don't want to fulfill such an extremly special request. However could you please provide the source files of the models additionally to the stl files so I don't have to recreate the whole fan duct from scratch? If there is some sort of tutorial that describes how to create shapes like these, it would be very nice to provide this too, cause I have no idea at all how one can create such a shape. Thanks in advance and have a nice easter. Would you be willing to include a STEP, or some other neutral format? I used this on my original A8 and loved it. But since I've moved to a different hotend and x-carriage. I would love to remix this but trying to do it with the STL's is a pain. I tried this and hits the heat block...anything that I'm doing wrong? ,,I guessing its because I have a e3d v6 clone. I'd rather you made a remix. I use your design now for some time and I'm very happy with it! It also indirectly, inspired me to create this design: https://www.thingiverse.com/thing:2975487 (due to the empty space over the nozzle, between the fan and the holder). It's not a simple, "rectangular" design, which you can do easy with FreeCAD for example (I have experience there) because for changing it you have to convert it so a solid and you get thousands of independent polygons. For the unwanted case, that you still prefer a remix from us, what software have you used to design this? I'll take a look and see if I have time to modify it for SUNON fan. If you are using the pla version(one with no a) , just connect it by plugging it into the fan like what you do with the original. If you printed the abs version (one with a), then just loose both screws on the fan leaving enough space to slide the fan in , you would like to slide it in diagonally from the right side of the blower output , just use the edge of the right side to cling it up untill you hear a click and you are set to check if it is actually positioned identically with the picture, it should be set if the fan's position is identical and the height of the nozzle is correct. If the bottom of the nozzle is not at the right spot , you might need to remount the nozzle. The version numbers "no a" or "a" have nothing to do with used printing material !! Version "a" is for mounting the Mistral on the outside fan (recommended) and "no a" is for mounting inside the fan (not so recommended). It appears I have a blower that doesn't allow fitting the duct on the outside. I haven't printed your amazing model yet. But I have been having a good look at my blower fan and cannot see any way of fitting one on the outside. The printer is only around a month old, and came with all the cables crimped out of the box much to my surprise. So it's possible they changed the blower? I uploaded a photo of the blower anyway just in case. I am a total noob when it comes to 3D printers so that could explain a few things! But I'm getting there slowly. Nope, same blower so you're good to go. Hy Leo! What is the position of the Extruder before starting the PID? In "home" or as if you were printing over the heated bed? I did the PID in home position (center of the bed ca. 20 mm high). I e.g. start the fan speed at 0 RPM on the first layer and then gradually reach max RPM on the 5th layer. Why could be this doing this particular temp down when the nozzle is in the bed like it was printing? Hi, I bought my Anet A8 on december 29 2017 and received it last week. I'm printing a lot of upgrades, but don't seem to fit all the time. Today, I printed the version 2.1 and the 2.1a ,but none of them fits to my anet. The 2.1 is too big to enter in the hole of the fan. The 2.1a needs like a spacer or someting because it is directly fix on extruder plate holder. I take out the fan and installed it, the fit is good but not steady. The little rectangle for entering the fan clip is not exactly the right dimension :/ Can you help me because your design is pretty awesome!! For ones that seem to be a tad loose I just put a rubber band under the bottom. I find it is a good idea anyway since the vibration can mean it may work it's way out. I'm certainly happy to read that it's working great for you. Enjoy! HY, the blower fan got to be running at 100% before start the PID? Yes, it should fit over. In your case I wouldn't force it because yours turned out quiet a bit smaller. Maybe removing material from the inside of the duct might work. It was user error! I took the fan back off but instead of hooking it together starting with the outside (large) side I started with the smaller lip and it slid right in perfect. Now the nozzle is dead center. Thanks a bunch. This fan has had the single biggest improvement in the print quality on my A8. I had a 16 hour print running immediately after it was fitted and the quality was damn-near perfect. Thank you for this post. It fits perfectly and works better than the original Mistral on my new A8. I'm happy that it works for you as expected. TL;DR - Make sure your nozzle is centered between the two fan ducts. I just wanted to share, I had a ton of problems with this when I first printed it... I couldn't go higher than 70% without getting thermal runaways... I recently decided to either figure out what my issue was, or find some other nozzle that worked better. I had done several PID tunes, upgraded to marlin 1.1.6, and several other things... Well, I never thought to make sure the nozzle was in the CENTER of the two arms (sighting down from the front).. .I had to loosen the set screw on the bottom and the nut on the throat, and rotate the whole bracket slightly... But once I got it lined up in the center, this thing works great! Every time I slice one of the fan files (all of your designs) it crashes Repetier. Has anyone else had this issue? I've tried three time to print this (2.1A) and every time my nozzle is about an 1/8" off the bed using Cura. Everything before and after printed fine. needed the shorter one for the e3d conversion on the anet A8 the right side fan duct touches the heat block with a silicone boot. added a second piece of silicone rubber there to protect it. PLA. no problems since then. truly great efficacy! and the largest amount of airflow ive seen in the 5 or so cooling ducts ive tried! and its by far the most quiet! this is from the reduction of air turbulence. great design and awesome that someone would go through that much work to perfect the thing. I'm happy that it's working great for you as well. Please click on my Make, below, to see photos. The right hand print, v2.1a-4.5, was sliced using Cura. This is the third time I printed it thinking the gaps in the print were caused by my printer. I finally noticed that Cura was not slicing this correctly because the gaps are in the model. I then added supports and noticed that they went through the duct. Printing without supports yielded what you see. I then moved on to Slic3r which showed no such gaps and printed what you see on the left. This is v2.1a. If you look closely, you can see a square hole in the duct that looks as though it was patched by either the slicer, or changes that may have been made by Slic3r to better print the model. Now for the oddest thing of all. Notice that the portion of the model on the left that mates with the fan is reversed! I reloaded the exact same model and as you can see, this time the model is correctly oriented. Hey, Leo, I've been running the Mistral v2.1a for awhile and love it. Thanks! Would it be possible to alter the design to fit a blower mounted horizontally? That is, with the blower blowing across instead of down, and the intake facing up. I'll be modeling a mount for it, so the distance from the fan mouth to the hotend isn't critical. Hi! I tried using your fan duct but it touches the hot end, even if it is mounted exactly like yours in the photos. 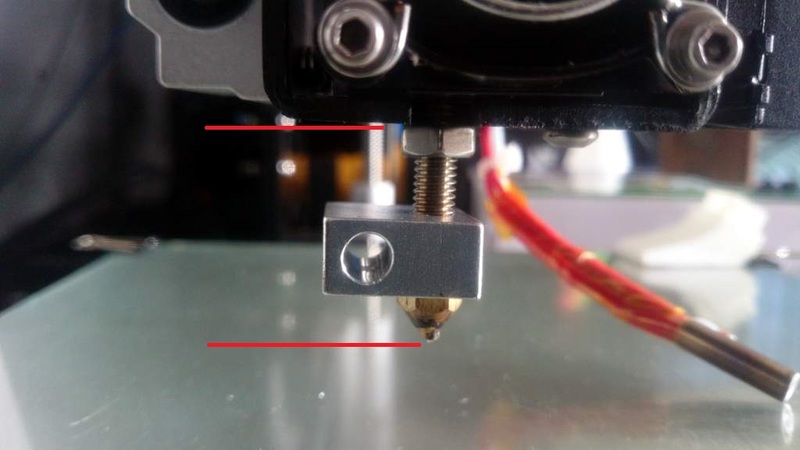 What can i do to put some distance between the duct and the hotend? I'm using your probe mount at https://www.thingiverse.com/thing:2188477 and you wrote that the Extruder Cooling Duct Mistral 2.1a-4.5 can be used with the mount. The mount is screwed between the black metal extruder bracket and the extruder fan, right? There is no space left between the probe mount and the fan where I can push the duct. When I loose the lower screw of the fan to press in the cooling duct the fan is out vertical direction. Do you understand my problem and can help me? I don't understand. Make a picture(s). Der Sensor-Halter wird ja direkt auf das schware Metall-Extruder-U-Blech von aussen angeschraubt mitsamt dem Lüfter. Im Querschnitt gesehen also Blech-Sensorhalter-Extruderlüfter. Unten und oben. Und alles ist senkrecht zueinander. Unten habe ich also eine Lage Bauteile mehr also oben und das gibt einen schrägen Extruderlüfter. The probe mount is screwed from outside onto the black finished Extruder bracket and the fan is mounted on top of the probe mount. So you have on bottom layer one part more and this results in a vertical displaced fan. Achso... Ja, aber das nur minimal und hat keinerlei Auswirkungen auf die Funktion. Dafür ist aber die Mistral sicher und kann nicht runterfallen. Mine printed beautifully but with my fan at anything over 25% my stock hot end will not maintain temp (it will just start dropping till it stops extruding around 140*). I've tried running the PID tuning sequence but instead of returning a single set of p, i, d terms it returns 3 that are all different. I chose one and entered it and it made no difference WRT to the overcooling, and I do not have it pointing at the heat block. Love the design! I have a small problem, the upper sides of the ducts touch the heat block and melt the PLA. And if I put the cooling duct lower it's below the nozzle? The only solutions I can see is that the 2 ducts should be wider? Hope you got some insight! I just looked at the other images... Your heatblock is on the opposite site of mine! Dangit, mine can only stay that way because of the hole for the thermistor is only on one side.. I'm totally confused by all that file versions... what file do I need with a standard Anet A8 printer using PLA? The description for each version is found in the "Summary". In your case you can use v2.1 or v.2.1a (which I would recommend). Look at the 1st picture to see the difference of both. Which one do you recommend? And there are basically two other cooling ducts for the anet a8. How does this compare to the Full circle duct, and the half circle duct? I had started out with circular ducts. I even designed my own but I had to find out that they were performing very poorly. E.g. these kind of ducts can't handle overhangs very well. I needed a way better performing duct and that's how the Mistral came to be. I would recommend using Mistral 2.1a. How should it look next to the extruder? Like at what level? Every Anet A8 is assembled differently. Should the ends be right at the level of the extruder? EDIT: Oh never mind you already have a photo of it on your printer Lol I'm legally blind. Thanks - I was confused because 2.1_10a is the only file with the word "Anet" in the name, so I was about to use that one. I'll try 2.1 then instead. Understood. Sadly I can't change the file names. Hi, by any change. Did you make a 2.1 version of 4.5? No, because I really don't recommend the inside version. With longer cooling ducts the chances of the cooler falling of is even higher. 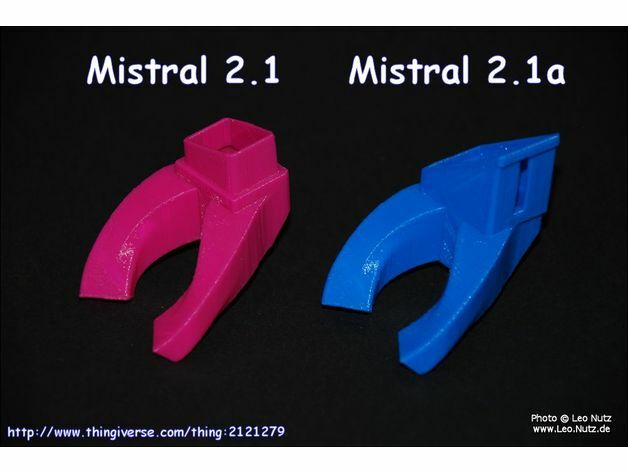 Use this https://www.thingiverse.com/thing:2188477 with the Mistral 2.1a-4.5 instead. I tried to print it but it looks kind of too long (the arms are a bit too long) i cannot provide pictures since i miss the fan at the moment. Sorry, I'm no longer supporting items that are not Anet standard and that I don't have. It has become too time consuming and too much work with little or no reward. Sick dude. You made a little radiator. Tons of channels for the air to lose heat. Freaking awesome. Please send me some pictures to [email protected] for me to look at. This has really improved the quality of my prints - Thanks! Which version drops lower than the hotend? Printed one up for my A8 and it exhausted right at the bottom half of my hotend and actually had to be adjusted so it wasn't touching. Needless to say, the ends melted during my first print with it and that resulted in it cooling just the hotend. That shouldn't be possible. I would need to see some pictures of your setup. Just as I thought. The heater block is mounted incorrectly. Looks like a none standard block as well. You also need to work an calibrating your printer. The print could see some improvement. It is a non-standard block (for an A8) but it isn't mounted incorrectly. The block is the same size as the one that came with the machine.. The throat is firmly seated in the block against the nozzle and it doesn't go further into the extruder. There isn't much more to that for a properly installed hotend. What would give you the impression that the machine wasn't properly calibrated? The print didn't turn out all that bad aside from the obvious. Is your heated table upside down? Normally the warning should be on the bottom and a smooth aluminum surface should be the printable area. You may have twisted the heater block 180 degree from the intended mounting position. I did the same thing with some melted cooling duct as a result. No, the printed surface should not be on the bottom. That wouldn't make sense, would it? Put the printed warning of hot surface on the bottom where you can't see it? Completely irrelevant but I use glass on mine anyway. It's not mounted 180°....the picture is from the rear so the wiring looks reversed. Logic would state that the words should be on top, but most PCB heat beds are designed for the smooth side up to be printed on, thus the words would be on the bottom. I am sure that the screw holes on the corners are countersunk from the smooth side, allowing a flat head M3 screw to be installed to secure it to the heat bed carriage. That is all Lallers was trying to convey. But as you stated, you use a glass plate so the direction is not an issue. For what it's worth, I have an Anet A8 too. And if you're open to some advice, per your pictures, it seems as if your X belt is pretty loose. And if it is, could it be possible that the Y belt has slack in it also? The blemishes in the printed duct, obvious in the pictures could be a direct result of those belts being loose. I guarantee you that if you tighten them, your print quality will improve by tons. And I agree with Laller, the heat block seems to be mounted 180 degrees off. If you spin it, the shorter side will face the duct, and not be in such close proximity and not melt it.Trust me in this, as I had the same exact problem. Spinning it cured that problem. X belt is indeed loose....or rather, was. I tightened it up. Looking at printing a tensioner for the x axis....I already made one for the Y axis. I'll look into the block orientation. I just installed it as the original was. Can You make version 2.1 lower from the extruder approx 5mm, I have a led mounted on the extruder and it hampers , thanks in advance. I have downloaded the files and loaded them into Repetier Host but when I go to slice them Repetier locks up. I have loaded some prints up that I have already printed and I don't have an issue. can anyone help me figure this out? I just downloaded all of them and didn't have any issues slicing them with Repetier Host. Maybe through the download process a file went corrupt. Try downloading them again. I'm using this with your fan-sensor mount and from a functional point of view, it works really good. Unfortunatly my radial fan started making disgusting scratching noises. I guess it doesn't really like to have the duct wedged under it. That really shouldn't be happening. Maybe it's because the sides where the fan has contact with is very uneven from the print? Using a flat file to flatten the surface might do the trick. It works perfectly. Highly recommended. Hi! I've printed the 10mm mistral cooling nozzle, and it is longer than my nozzle and bottoms out on the hot bed. I have a stock A8, so I'm not sure why I'm having this issue. I measured to the tip of my nozzle, and it is right at 25mm. The overall height of the mistral is 33mm. Did you not read the "Summary"? Uploaded Mistral 2.1_10a. Designed to be used with https://www.thingiverse.com/thing:2169370 in conduction with a E3D Volcano." Is it possible to get the step File for fusion 360 to remix it for better fit and dual 40mm fan for my e3d v6 holder? May be you can use this (blender file) https://www.thingiverse.com/thing:2133328 I use your holder but your air duct is not efficiency. Take a close look at my pictures/setup which gives a difference of max +/-2 degrees. What should I pay attention for? The pictures confuse me the same way as your file naming does ;). I think I printed the 2.1a. I need to start at 40% print speed otherwise I run in a THERMAL RUNAWAY. Then I slowly speed up to 60-65%. I can't go faster at all. Did you mount the cooler as seen in the reference pictures? Did you read the "Summary" with details on calibration? Oh yes I did. I just did I an Autotune again. but when I fire up my print with 60% initial fan speed I get a drop of 15C at least and it's unable to revover. I did it the autotune with 100% speed and it reached 230C without problems, so I'm confused here. Currently trying to find out the max speed I can get by slowly raising the fan speed over print time. Here's a picture of how I mounted it. From the picture I can say that the duct is perfectly positioned. Are you using the latest Skynet V2.3.2 (fix 2)? Are you using Repetier Host (Cura)? If so then I could give some tips on fan settings. For the first layers you don't want any fan on. Then slowly raise the cooling until you reach maximum at 1.2 mm layer height as in my example. I don't use this method to avoid THERMAL RUNAWAY but rather for the print itself. Post here should you come across to solving your problem. Thanks, I can now see that my nozzle/heatblock is too low compared to the fan nozzle, thus cooling the printing nozzle. I'm pretty new to printing, but how can i fix this? Can I just raise the printing nozzle? I'm surprised that you have the heater block that low. My setup in the pictures is a worse case scenario. Yes, I would raise the printing nozzle/heater block accordingly. For minor adjustments you could also loosen the two screws that hold the fan and move it up or down. Edit: Looking at your picture you might get away with it by loosening the fan and moving it down a bit. whats the difference between this and the spriya? Yes, that can be done. You will need to beta test before I put it online. I'll be using 2.1a ok? I'll look at both. 2.1a has the advantage that it won't fall off but more so has slightly more air throughput. OK, I've made a version from 2.1a. Send me your email to [email protected] so you can try it out. This is really the best one I've ever used!! Thanks!!! Don't forget to give it a "Like". I love this mistral cooler, could you help me adapt it to a "mk8 dual extruder" hotend? Sorry, there are some many variants I wouldn't know where to start and foremost find the resources. I'm putting my time and energy strictly into the "standard" Anet printer. What should be the correct distance from the bottom of the black block where the heatbreak comes out to the tip of the nozzle? Thanks. Is that just what your's is currently at or should that be the norm if assembled correctly? I measured mine because mine is worst case. It should not be more than 26mm. Try to keep it no less than 23mm though. Air should hit the lower part of the nozzle and the extruding filament. Very nice design! A bit more noisy than the original simple A8 duct (I believe it's because of air delimiter inside) but much more efficient!!! I tried to print 20mm diameter screw and found that thread bends up while printing - perimeters shrinks before infill starts to print (PLA). Then I decide to change original duct. And yes, it helps so much! This is the one I use now. Could you work off the measurements of this one? Sorry, there are some many variants I wouldn't know where to start and foremost find the time. I'm put my energy and time strictly into the "standard" Anet printer. However, you should find E3D V6 mounts that support standard cooling ducts. "Mistral" - a strong cold north-westerly wind that blows through the Rhône valley and southern France towards the Mediterranean, mainly in winter. The idea of giving it that name came from a beta tester. Please stick to the description! If you had 3 unsuccessful prints and you are a newby then you need to concentrate on your printer setup and calibration. Visit Facebook or Forums that deal with 3D printing to get advice on getting your printer to work correctly. I design the items so I should know what is best. Therefore you need to stick to the description for best print results. You are the only one to date that is having problems. Look at my prints and prints others have made. Your problems are major and obvious because of bad printer setup. As I mentioned and recommended in your made-it post: Visit Facebook or Forums that deal with 3D printing to get advice on getting your printer to work correctly. I can't See why having 2 fragile walls (See Curapictures - not my printer) should be better than having a solid wall - the weight difference is minimal. - By the way: I can't see a picture from you with the 4.5-Version. Furthermore I can't google a Problem which only happens with your print - My CalCube, Benchy and a Extruderbutton turned out pretty decent as far as I can tell (You can have a look at them on my profile) Thats why I ask you for advice - but obviously you are too advanced to take 2 minutes and look at it and help. It always comes out very instable with holes in the walls(Looking like this make: http://www.thingiverse.com/make:311097). Any advice? This will get you a functional print. But if your print looks like mine you additionally may want to reduce you temperature - Your print should have clear layers (Print the Polypearl tower instead of benchy and check your result with their FAQ). I changed to Simplify3D as Slicing-Software and reduced my Temperature from 200°C to 185°C (after first layer) and now have a significantly better result. thanks for the tip now it printed perfect. I've adjusted the settings in Cura in that way that I could see a solid wall everywhere. For me it was .6mm walls and 100% infill in Cura. This works like a charm. I printed a 4 towers stringing test before and another after. The stringing with this one it's much better. Great Job Leo. I've printerd the 2.1 and works ok, but my nozzle is a bit far way due to the sensor braket. can you make a 2.1-4.5 version? I'm excited to try this out :D Thanks Leo_N! Is the 2.1A longer than the 2.1? I see that it is for use with the autoleveler but doesn't specify what is different asside from how it connects to the fan. I'm going to print this if the 2.1a has longer arms to reach the extruder better. The lengths are the same. Only the way they are mounted to the fan is different. If you have the standard A8 setup then you don`t want it any closer. Hey Leo_N, first of all: thanks for the work! i used ur 4.5 to print only PLA and it works rly well! i just took the original Anet A8 fan duct and i was able to print the heattower. seems like your fan duct is cooling the nozzle way too much. do u know about this problem? maybe you got a fix for that? First thing I noticed is that you don't have a standard setup. Your heater block is rotated by 90°. You're no longer using a heat sink and fan but instead you're cooling the top of the stepper motor for some reason. However I do not know how much this effects thermal runaway. One reason could be that the air is deflecting off the build plate and hitting the heater block. What firmware (version) are you using? What sensor mount are you using? It would also be nice if you made a picture of your extruder with the mounted fan. Send it to (deleted). Yes I can do that. However I need dimensions. Do you have standard A6? If then I would need some pictures of the extruder area. I'd then mark some places on the pictures where I need dimensions from you. Yes, I have the standard A6 and also the pictures of the extruder area. Please let me know where I can send them to you. Thanks! Send them to (deleted). I'll get back to you on the weekend. I'm also intrested in the A6 version, is it done already? Would love to try it out! Send me your email to [email protected] for further testing. I have send you an email, did you receive it? I am also interested in this for the A6. I've given this project up as it is costing me to much resources. Feedback quality has also been unreliable. It's not a good idea to design something to which you don't have the hardware. Working on it..... Just give me some time as I need to get the dimensions for the A6. Are you still waiting on the dimensions? I'd love to help - I want to try the Mistral but also have an A6. I can send the measurements if that will help! I'm almost done with it. But this will be a trial and error effort. Hello, is the version for ANET A6 available? I can be a beta tester if you want. Worked like a champ. I printed a large Raspberry Pi case & PI zero case at the same time to test the new unit. I like these better than the circular fans everyone raves about. Using the new duct both the PI prints came out well and it seemed to have less stringing. THANKS for sharing your work !! Thanks. Every circular cooler that I could test didn't bring the results that I was looking for. I even tried my own circular duct but was never really happy. That's why the "Mistral" came to be. I removed the file. Will upload fixed version shortly. Update: Fixed version is up. Hello there. I have been a fan of your stuff for quite a while now and would like to give this fan duct a try. However my extruder is higher than it was originally. Is it possible to make a shorter version and if so how to I take a correct measurement? This improved the bow on my benchy significantly over the center nozzle duct. Thanks! New version uploaded. Please test. i did, looks nice, fits well. thanks! will you also add a version of original mistral ? thanks in advance for your good job! Please make a picture and post it under "Made". I was using the older version before I added the Gearbest Auto level sensor, and it worked great. Yesterday, I added the sensor, and the bracket that holds it, and I find that the length of the duct is coming up short. Before, the duct would make it so that the extruder couldn't keep up 200 degrees, so I'd turn the fan speed down to 85%. Now, with the level sensor bracket installed it's keeping 200 no problem. I will try the new version and see if I can obtain the same results as before. I'd like to keep the auto level sensor and the cooling duct on the front of the Anet A8, because I intend to put some type of X axis belt tension adjuster on the back. I'm not really understanding your problem. If you are using the Gearbest level sensor and mounting it on the extruder bracket behind the fan then you need to print the Mistral 2 "4.5". It will compensate for the thick sensor plate. I thought I explained it pretty well. I have now printed the Mistral 2 "4.5" and it works very well. Just as well as the older version, before I had added the bracket with the auto level sensor. Thanks again. AAhhhh OK. Glad it's working for you. Yes, I will consider it. So the plate that holds the sensor is exactly 4.7mm? OK, I will see what I can on a version with 4.5mm added distance. Object had to be rotated. Removing internal supports is a bit of a PITA, but doable. Seems OK but bottom layer not very clean yet, as can be seen in my 2nd photo. Selected Build plate type "Brim", but I need to learn this. Please read the instructions. It's all there on how to print it. 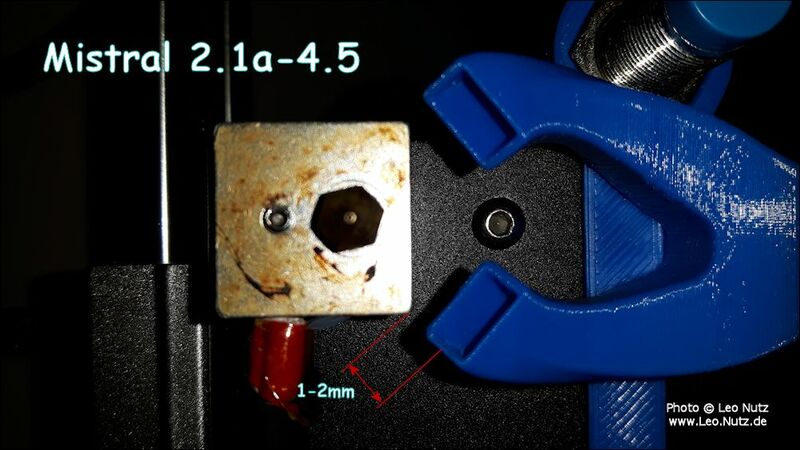 "Mistral 2.1" Extruder Cooling Duct for the Anet A8 Printer by Leo_N is licensed under the Creative Commons - Attribution - Non-Commercial license.